It’s a different sort of summer. For months (years) we’ve been encouraging (harassing) my parents to change their living situation. I sugar coat all the words to make the struggle easier. And I can’t stop myself from thinking about myself and my husband, and our same age peers – what living situation will we choose in our ‘golden years’? Without doubt we will all want to stay in the houses that we’ve renovated and refitted with carefully chosen granite and then more fashionable quartz , where we’ve taken down walls making great rooms as great rooms became the fashion. But when the time comes, as it has for my mom and dad, when that big yard, the staircases, even the meal preparation and bringing in food, has just become too much – where will we land? It’s taken a while for my four siblings and I to all be on the same page agreeing that, as proud as we may be that these people that raised us have managed to keep their own household going for all these years, (65 years in fact) but now it’s time for them to have an easier life. My dad has various health issues now and simply put – they need a supported living situation. I could write a book on the journey involved in searching out the right – what I call – ‘retirement residence’. I call it that because it sounds nice and (fingers crossed) hopefully it will be. My parents will have their own apartment- we are not talking about a nursing home or the dreaded ‘long-term care facility’ that one might need some day. They’ll have a bedroom, living room ‘kitchen area’ and the oversized bathroom these places feature. It was that tiny kitchen that we all wished was something more. They’ll have room to bring the dining room table we’ve told our stories around, but there are just a very few cupboards. Where to put the platter that’s held the turkey for decades of Christmas’s , or the collection of vases from years of bouquets, what about the big bowl for popcorn with a movie on tv, or the big lemonade pitcher for drinks when family arrive with thirsty little ones? Because of that tiny kitchen ‘spot’ we took my mom and dad to view a higher end retirement residence this week. No question that it was attractive and, despite it not being necessary – with three meals provided in the first floor dining room- it featured an actual kitchen, complete with full fridge and dishwasher. This brand new building, with residents moving in for the very first time was lovely, but when we returned to the place more comfortably within their budget we saw folks already friendly with each other chatting on a Sunday afternoon outside, and in the dining room an elderly woman was playing the piano loudly and with spirit, for whoever cared to listen. We went up to take measurements to see if perhaps the china cabinet might fit, to hold special treasures and more practical items (it will) and I stared down the mini fridge. I know my parents will only need to keep a quart of milk, or a few refreshments for when they don’t want to walk down the hall to the ‘bistro room’ that is always open, but it is the idea, that after a lifetime of taking care of themselves they don’t need their own butter or mayonnaise or a dozen eggs, that is bothering me. That will be okay, mom, I think. We’ll go out to shop for what makes you happy in that puny fridge. In the next few weeks we’ll get busy choosing how to make this home. We’re putting our trust in the good we see here – the supportive kind staff we’ve met, the opportunities to socialize with your peers around new tables, and that wonderful woman playing the piano. It’s been a different sort of summer. I’ve been living the dream, as they say, staying four long weeks at our lake place in the North Shuswaps. We’re on the shore on a stretch of water that carves up this forested place with arms that go off for miles in a multitude of directions. My kids, and granddaughters, and my younger brother, a niece and a nephew, a dear cousin, and good friends have circled round this stretch of lake this summer, through little villages that burst with seasonal energy – to swim and boat and break bread with me. Odd to say me, not us. But I’ve had to host alone this year as my husband’s had a strange summer too – an extremely arduous aspect of his work has unfortunately landed smack in the middle of normal holiday time. And the summers had another weight to it – my elderly parents have had a lovely family member as the live-in caregiver they require, but she needs to move on now. My siblings and I have all spent time trying (oh man, we’re trying) to convince both our mom and dad that moving into the nice, comfortable, sociable, well managed … seniors residence we helped my mom find will be a better choice then the house they can’t manage any more. Honest dad, it will be. So I’ll bring up the beach chairs, tie the kayak high on the shore, wash one more load of towels, close the blinds, pack the hanging planters into the car with my suitcase and big box of BC peaches and wind my way around this giant lake towards home. It’s been a different time as times go. And I’ll surely blog about the time to come. 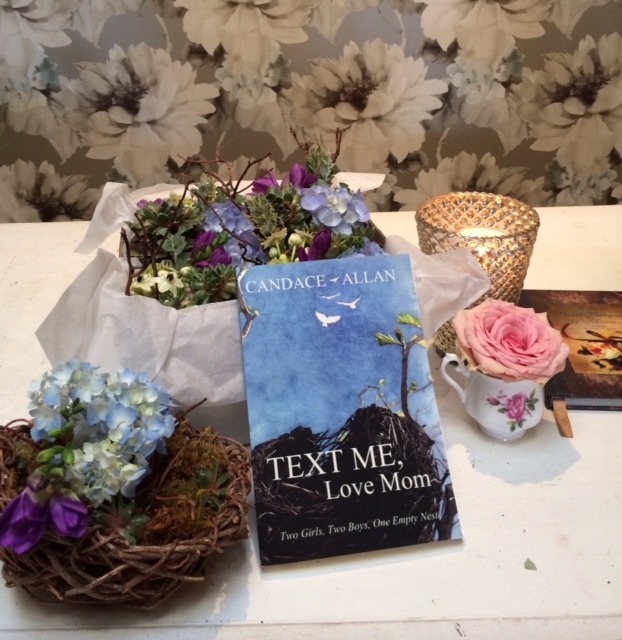 Looking for another read by Candace Allan – check out the book Text Me, Love Mom, Two Girls, Two Boy’s, One Empty Nest. As I hustle and bustle and get ready for three of my grown and flown kids to return for Christmas, and dream of a little bit of snow, I thought I’d post my reader’s favorite holiday blog. “I’ll be home for Christmas; you can count on me” … such simple words, but where is home? – I suppose my immediate answer is where my mom and dad are. I did spend all my Christmas’s with my folks until I became a parent myself – I recall the bustle of Christmas Eve, so pleasurably and wildly chaotic with five siblings and later girlfriends and boyfriends and always so much to do, the early dusk arriving and still wrapping perfume sets, or walkie talkies and macramé plant hangers, someone calling out for tape, or shouting for their turn in the shower, or sneaking into the once-a-year-special marshmallow peanut butter squares, too sugary delicious to wait for, then curling our hair for church and marching through snow drifts to get to the car. “Please have snow and mistletoe And presents under the tree” … And suddenly there was a transition. I was married with our first little baby and though my parent’s house was just a ten minute drive away – home had shifted. I wanted to leave the jumble of family at my parents and wake up with my tiny girl and husband to share something sweet together around our first tippy decorated tree. Since all those years ago we’ve usually managed a crazy mix of several homes, my parent’s, mine and my in-law’s -except the two years that we brought home our wee baby boys, both born weeks before the holiday. Those years we stayed put on the coast where my husband was in law school, more for the baby’s sake and mine. On each of those home came to us – our parents or siblings arriving with tiny outfits and trinkets to fill the stockings of bright new Christmas babies. “Christmas Eve will find me, Where the love light gleams”… My four kids are grown and have almost always come home for Christmas. I’ve felt the exhilaration of them returning from university with plane loads of students, most thrilled to be away leaving independent lives, but back in parents arms at the airport you can hear the audible sigh of home. The first year that one of our four didn’t join us for the big unwrap fest and Christmas morning wife saver egg strata with o.j and champaign, all three of the females in the family hid our weepy tears. Our eldest son was gainfully employed working through the holiday season as a liftie on the slopes of Whistler resort, and the rest of us couldn’t have been more conscious of the miles and miles between him and home as we steamed the Christmas pudding, carved turkey and settled in around the table. “I’ll be home for Christmas….” Of course, home is here now in this house where I raised my kids. I’m cooking today for Christmas Eve. In the wee hours I searched through recipes for something new, thinking that perhaps I’d switch it up, try a fish pie or seafood casserole, but sometimes you just want the same in this life. Like the year I finally got too embarrassed of the poorly stitched oddly shaped stockings I’d made when the kids were small. I bought lovely, bright, too big felt ones – who knew that my four darlings were quite attached to my sloppy efforts from years past? I imagine they’ll be looking for the same old-same old Christmas Eve fare – cracker crumb fried oysters, rice pilaf and rich butter tarts. The leaves start to drop. The air is fresh. A school playground fills with shouting kids, and pick-up soccer games – and I feel melancholy, but on the edge of excitement, too. More than January, isn’t September the time of new beginnings? New grade school? College and university? Parents and kids fill backpacks with crisp notebooks and coloured pencils, then head to the malls looking for squeaky new runners? There are anticipatory trips to Ikea to deck out tiny dorm rooms or studio apartments full of furniture with funny Swedish names. But there’s boo hooing all across the country too, for all those kids heading out the door with hockey duffles converted to super suitcases, and back packs hiding that favourite worn out stuffie, or that last pair of sandals hopeful for another month of warm weather? I have four young adult children who are just now getting used to my having written a book about this next stage of parenting, about all those Septembers – those goodbyes until Thanksgiving. When Zoë, the eldest, left home, her copies of Love In the Time of Cholera, Harry Potter, and Dragonquest gone from the shelves, her colorful collection of shoes gathered from the closets, and her vanilla-scented products stripped from the bathroom, I searched the self-help sections for a manual on how to let go. Now that I’m a true empty nest-er, it seems a bit odd. After all, I still had three hyped-up teens in the house. One of them leaving home should have given me a little more room to breathe. But it didn’t. It took my breath away. I was able to relive it all, writing Text Me, Love Mom; Two Girls, Two boys, One Empty Nest. (Hey kids – I gave you pseudonyms – relax. Nobody knows who this Zoë, Cole, Hudson and Lily that I write about are.) If you’ve been following my erratic blog, I’d love it if you check out my book. It’s been one hec of a ride. And if one of yours has packed up and will be spending winter and spring in another part of the country, or maybe another country – it’ll be okay. Really. Ah – Summertime – Sweet, Sweet Summertime. It’s June 23rd. The days are long but we’ve past the very longest day of the year – which might make me melancholy – accept I’m forever mindful of that schools out schedule, and so feel that summer stretches before us still, in all it’s short sweet Canadian glory. The apple blossoms have faded but the peonies are still blossoming and hanging their lovely heavy heads. It’s disheartening to know they will droop and scatter their generous petals soon but in a few days the garden vegetables will be ready and my favorite – the raspberries – will follow. One of my earliest memories is of picking raspberries beside my grandmother in a magical patch of juicy red sweetness that absolutely enveloped me. And there will be days and nights at the lake – kayak and canoe trips sliding over the still water, swims at sunset and campfires after dusk. Evenings with family or friends gathered around an outside table slurping up the sweetness of peaches and cream listening for the call of a loon on the lake and seeing flashes of fireworks on another shore. It’s February today – the month of love. We need more love – not just now, always. During a previous late winter I wrote about wanting to start a campaign. Let me say it all again: It doesn’t have to be on every bus bench or t-shirt or go viral on the internet. It is made up of two simple words, ‘Look Up’. Look Up. Look Up. Look Up. Though, my campaign has a subtitle – ‘Love the One You’re With’. So, right now, stop staring at your screen for a minute and smile at a stranger. Smile at your partner. Smile at the person at the next table. The one right beside you at the transit station. Didn’t you go out to a coffee shop to escape the loneliness of working at home? So let your eyes and your humanity drift away from focusing on your Ipad. Take a break from texting on your cell phone. Look Up from the work, or play, that is keeping your attention on your laptop. Engage a stranger, if only with just a smile. I am guilty, too. I have to wait to meet a friend at a restaurant table, and I immediately reach for my phone – the phone that connects me with all the people I love. I hear that twinkly sound of ‘you’ve got a text’ and I’m immediately eager to see who is reaching out to me. “No, just Look Up”, I tell myself. The greeting will be waiting for me, if I just resist the urge to look down – away from the world unfolding around me, the toddler impressing his parents at the next booth, the waitress who might linger at my table, or I could gaze out the big window – see the lovely setting sun, the small birds on the horizon, the row of frosty trees. Or I’m alone having a pick-me-up in a favourite coffee shop – so what do I do? Voila, I reach for the comfort of my phone, to check my text messages, my email messages and maybe even google the weather. Instead, I could resist the temptation to touch my cool perfectly weighted phone (thanks Steve) and smile at a stranger, or pause to connect with a silly comment about the weather, the way people used to – in the old days – sharing a thought with someone new. Worse is when we can’t resist the sneak a peak at the iphone when we’re not alone, but are with friends or family that we’ve sought out, or who have sought us out, to spend a few low tech minutes of actual straight up human connection. That’s where the subtitle comes in – the ‘Love the one (s) your with’. Candle light, bundled-up babies, knit sweaters, warm coffee with close friends. I’ve just been learning about ‘hygge’ – a Danish term for the art of accepting the long dark days of winter and taking a gentle respite with them, the concept of restorative coziness and making ordinary moments more meaningful. While making cranberry sauce and watching The Gilmore Girls revival on a snowy evening (very hygge) I heard the most delightful quote – ‘I cannot remember the books I’ve read any more than the meals I have eaten; even so, they have made me.’ – Ralph Waldo Emerson. Oh, so true. How books make us. And too, how we make books. When my eldest daughter, an artist and lover of science, was pregnant – she sat quietly with winter storms outside, and sketched the embryonic happenings going on inside her womb. Her soft sensual drawings of egg to babe are scientifically accurate but are surrounded by imagined creatures, flora and fauna. The baby would be named Alice, and the book, Alice in the Womb. Alice in the Womb, is so hygge. It’s visual narrative engenders a feeling of well being and thus it’s an unique and soothing colouring book, and a beautiful learning tool (the drawings are numbered for referral in the glossary), but most of it details the rich inner life of nine months in the womb. My daughter now has a second daughter – and has created a second book – the wild and unusual ABC Monstrosity and 123 – for kids and grownups to colour or read. With two small children and an eclectic art practice, her days of hygge are fewer, but she couldn’t be more content then on her trips to the nearby post office with a cozy little one’s mittened hand in hers, and copies of Alice in the Womb or ABC Monstrosity to deliver to destinations far and wide. Order now from Shea Proulx through Etsy or Amazon and you’ll receive them in time for the holiday season – packaged with lots of love. Click here for Alice in the Womb from Amazon and ABC and 123 Monstrosity from Amazon.